ARLINGTON, VA - May 22, 2018 - Education technology leader Hobsons recently announced the release of Naviance Insights, a new analytics solution designed to track and analyze college outcomes. 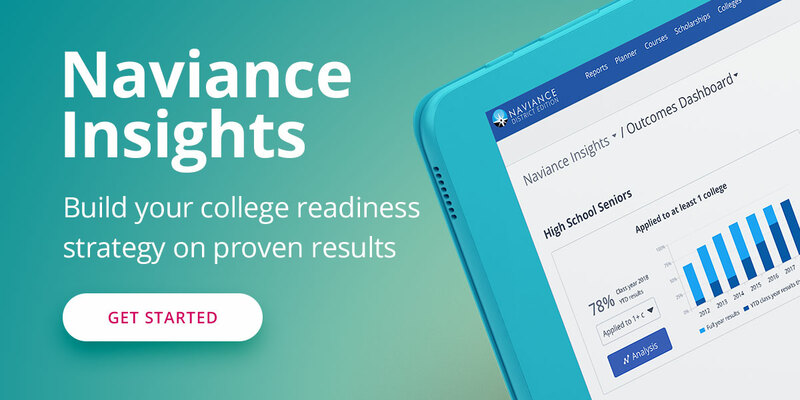 By providing visibility into various factors that impact college success, Naviance Insights enables districts to build a college readiness strategy on proven results. College outcomes are a key measure of student success for districts, schools, and state education agencies - but can be time consuming and difficult to get reliable, actionable data. Naviance Insights provides districts access to actionable data to analyze outcomes and inform their strategy. Understanding these outcomes will enable administrators to direct resources towards the most effective readiness programs. The Outcomes Dashboard within Naviance Insights is included with every Naviance subscription and allows educators to track key college outcomes, including the number of students who have applied to 2- or 4-year colleges, students who have been accepted to at least one college, and students who have enrolled in college the first year after high school graduation. Year-over-year results enable educators to identify college outcome trends, and on-track metrics enable staff to determine if current students are ahead or behind previous classes in key outcomes. This summer, Naviance by Hobsons will release Naviance Insights Premium, consisting of the Analysis and Comparison Dashboards. Naviance Insights Premium will be available to Naviance subscribers for an additional fee, and will enable educators to analyze 17 research-backed variables that influence their students’ college outcomes. With custom analysis of student groups, educators are able to analyze the factors that influence success for different student populations. Naviance by Hobsons is the world’s leading college and career readiness platform that helps more than 13,000 K-12 schools and districts to align student strengths and interests to postsecondary goals, improving outcomes and launching students on a path to succeed after high school, whether their next step is a 4-year university, 2-year community college, trade school, the military, or directly into the workforce. Naviance is recognized as the 2017 SIIA CODIE Award winner for Best College and Career Readiness Solution. The leader in education technology, Hobsons helps students to identify their strengths, explore careers, match to best-fit educational opportunities, create academic plans, and reach their education and life goals. Thousands of K-12 and higher education institutions partner with Hobsons and leverage our expertise and our solutions -- Naviance, Intersect, and Starfish -- to improve college and career readiness, college recruiting and admissions, and higher education student success to support millions of students around the world.